Please call owner Rick at 513-703-2593. Boat Location : Cincinnati, Ohio. 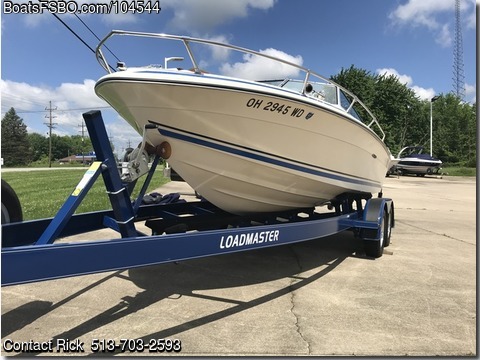 This Sea Ray has been stored inside when not in use and has had meticulous maintenance since Day 1. It is a rare closed-bow model (with a front-mounted gas tank) that jumps up onto plane for water sports. Sea Ray dealers will confirm that these models have more teak, more chrome and thicker fiberglass than newer boats. The gelcoat has its original gloss with no degradation from UV exposure. She has an upgraded Alpha 1 outdrive and the V8 engine has been upgraded to a 350 Mercruiser with a 4 barrel carburetor. Compared to newer model boats in this class, this boat is a bargain.